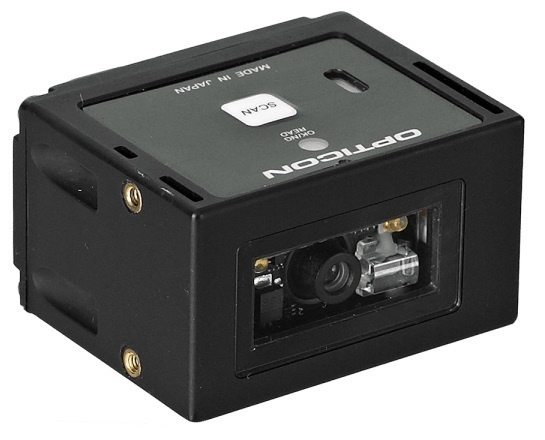 The NLV-3101, a 2D CMOS fixed mount imager, quickly and efficiently scans 1D and 2D barcodes. This scanner is ideal for retail or industrial barcode scanning applications. The NLV-3101 features red LEDs to illuminate the viewable area and green LEDS to precisely target the barcode to be scanned. Additionally, this fixed mount scanner has picture-capture capability: scanned images can be viewed to assist with troubleshooting in industrial applications. This fixed mount scanner is ideal in situations that require both 1D and 2D scanning at a high speed. From previous customers we see that the NLV-3101 is used in retail P.O.S., self service solutions like a kiosk, parking lot ticket machines and it is frequently used in medical or pharmaceutical analysis machines. It is clear that this scanner is applicable in a wide range of markets. For this reason this is such a popular product. The NLV-3101 is the best 2D fixed scanner Opticon ever made because it is fast, durable and reliable. This stationary scanner comes with an USB HID/VCP or a Serial interface. Its dimensions are small measuring just 41.1 x 33 x 24 mm, therefor it is a perfect fit for most appliances. Furthermore, this scanner is flexible so it suits most OEM or ODM applications that require a high specification 2D CMOS camera for all their scanning purposes. In conclusion the NLV-3101 is a very suitable fixed position scanner for demanding OEM and ODM projects. There is more to the NLV-3101, all the specifications and details can be found in the leaflet below. Opticon NLV-3101 Barcode Imager Serial RS323C - with Power Supply, Fixed position 1D/2D Imager, High speed scanning, Data editing program, Most compact 1D/2D scanner, LED aiming, Various interfaces. Opticon NLV-3101-USBCOM Fixed position 2D Imager - High speed scanning, Data editing program, Most compact 2D scanner, LED aiming, Various interfaces. Opticon NLV-3101-USB USB, Fixed position 2D Imager - High speed scanning, Data editing program, Most compact 1D/2D scanner, LED aiming, Various interfaces.